Recently Micromax has launched its Doodle 3 smartphone. 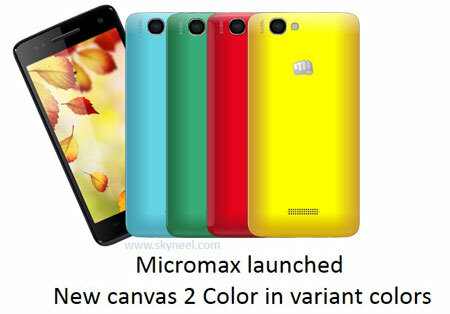 Just after its launching Micromax launched Canvas 2 colors of HD features in color variant for users. In fact users can change its back cover in different colors. These phones are listed on Micromax’s official website. We know that there is a great competition in the mobile sector now Micromax has launched new canvas in variant colors like Lumia with the name of Micromax A120 Canvas 2 Color in the market. In 2012 Micromax launched Canvas 2 A110. This smartphone was very popular in youth. It was just became out of stock just after it came in market. Same position was of Canvas HD. Although companies other phone got good scores in gadget reviews but they couldn’t became best seller like Canvas 2 and Canvas HD. Probably that’s the reason that company launched new variant of it’s old smartphone Canvas 2. Micromax’s this new color variant is coming with specifications of Canvas HD. This phone has 5 inches screen size. Its resolution is of 1280*720 pixels. Its screen is made of IPS display technique in which one can see about 16.7 million colors. This phone is launched in black, red, yellow, classic white, green and blue color. No information is released about what will be the price of phone and when it will available in market. This phone has 8 mega pixels rear camera. It has facility of LED flash. Along with it, this phone’s HD video recording gives 1280*720 pixels resolution. There is 2 MP fixed focus front camera in new Canvas 2 color. Users have to disappoint in matter of operating system. This phone has 4.2 Jelly Bean Android which is about one year old. If you are thinking about new version of Android this phone will disappoint you. This phone has 1.3GHz quad core processor. Along with it has 1 GB RAM which is good option for Smartphone’s gaming. It has 4 GB internal memory. In which 0.98 GB is for apps and 1.61 GB is for users data. Company claims that it has 2000 mAh battery which gives this phone 7 hours and 45 minutes talk time. Along with it gives 225 hours standby time. It has network support for 3G, Bluetooth 4.0, Wi-Fi, USB 2.0, GSM/GPRS/WCDMA. Along with it, it has GPS location tracking system. This phone supports 3GP, MP4, AVI (MPEG). It supports 1280*720 pixels videos. It has facilities of MP3, Midi, AAC, Amr, Wav and FM. 1. It is comes with variant colors. 2. Good Ram and Processor. 3. It is comes with HD features. 1 . This phone miss latest 4G mobile network. 3. Miss Android 4.4 KitKat. 4. Internal Storage for App is low.